The Mini John Cooper Works Roadster offers Lamborghini levels of fun at a 10th of the speed, says Sathnam Sanghera. In general, I like to time my test drives to coincide with a trip beyond the M25. There's no point driving around London - you rarely get above 20 mph, the roads are incredibly stressful, and it can cost you more than £40 in taxes and charges just to drive to the Spice Girls musical and back. You would get a better sense of a car by sitting in it at a motor show. However, due to circumstances out of my control, my week with the Mini was spent trapped in the capital. And then it snowed. A lot. So I didn't get a great deal of use out of its main feature: its semi-automatic soft-top canvas roof. But I did end up driving it every day. And you know what? 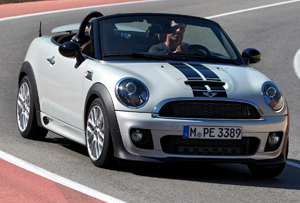 This Mini is a rare thing: a convertible sports car that is huge fun to drive at low speeds in the city. The main factor behind this enjoyment is the ferocious engine that turns the car into a veritable go-kart. Wheel spin on a rainy Euston Road at 15 mph. Power slides on the Camden Road behind the 214 bus at 18 mph, while somehow remaining agile, stable and taut. Essentially, this Mini gives you all the thrills of driving a Lamborghini at 130 mph, but at a 10th of the speed. But, as with any red-blooded Italian sports car, there are downsides to such performance. There are no rear seats, so the MJCWR is not going to be popular with estate agents wanting to show couples overpriced flats in Wandsworth. The engine noise is thrilling in small doses, but I imagine it would become grating over time. The looks scream: 'I've just passed my driving test and reside in Teddington.' Also, the ride is seriously unforgiving. It reminded me of the last Caterham I drove. Though, again, this makes the car strangely suited to London. Because, let's face it, one of the things that makes people drive like maniacs in the capital is that they can do so cocooned in comfort. If they felt every single speed bump and pothole, they would pootle around more diligently. As I did in this car, rarely going over 25 mph, but feeling at the same time I was thundering at 225 mph down a German autobahn.